In the 1870’s two brothers, John and George H. Ober, founded the Ober Manufacturing Company of Chagrin Falls, Ohio. Although primarily a woodworking machinery manufacturer, the foundry eventually also produced a variety of cast iron household products including the Ober stands and sadirons that are so valued today. Ober was also one of the most prominent American manufacturers of toy irons at the turn of that century. Ober sadiron stands, because of their smaller size, served double-duty as coffee, tea, or table stands. The handsome square, grid, and leaf patterns were available in either a japanned (black enamel) or electroplated nickel finish. Ober sadiron stands are interesting castings to collect; and since there were a limited number of designs a complete set, although not inexpensive, is attainable. 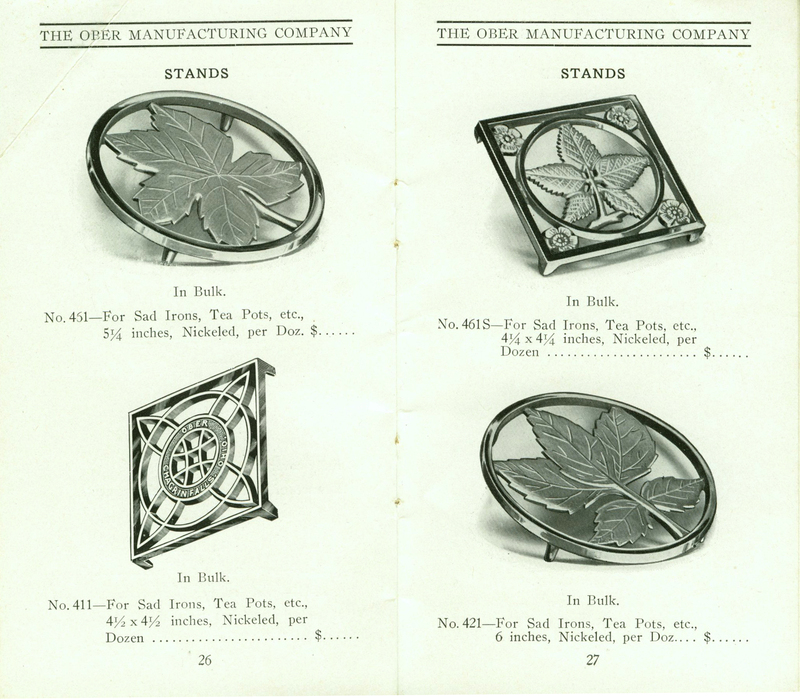 The following trivets appeared in a 1914 Ober catalog. The Ober foundry continued production until 1916, with the Ober Large Leaf design being one of the last issued sadiron stands. Although the foundry was formally sold in 1932, family members ran the company as a machine shop until 1960. At that time the building was condemned, the property sold and the area cleared and converted to parking and storage. ☆ UPDATE 7/6/18: The Chagrin Falls Historical Society has quite a collection of Ober trivets, stands, irons, and other items related to the Ober Manufacturing Company, including some company records. In 2015 the Society moved to the George H. Ober House at 87 East Washington Street, Chagrin Falls, OH. Museum hours are 2 PM to 7 PM on Thursdays and 11 AM to 3 PM on Saturdays; and by appointment. Their museum website is chagrinhistorical.org and the museum’s archivist can be reached by email at Chaghist@gmail.com . Clicking below will open a photo gallery featuring an example of each different trivet design produced by Ober. Note: only the leaf designs were signed on the reverse. Ober Square No. 2: 4 1/4″ square, CI; plain, without markings. 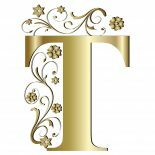 This entry was posted on April 15, 2017 by Lynn Rosack in Antique Trivets & Stands, Foundries & Distributors, Pressing Irons, Toy Trivets & Irons and tagged cast iron, Chagrin Falls Historical Society, nickel plated cast iron, Ober Manufacturing Company, Update.